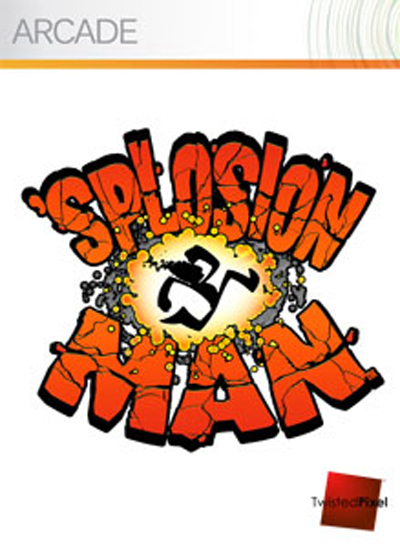 Splosion Man is the second XBLA title coming from the developer Twisted Pixel. Their first was the expertly crafted "The Maw." Splosion Man keeps the same type of cartoony style to the graphics, but changes the game from an exploratory 3rd person 3D game to a twitch based 2D platformer. And it works wonderfully. Splosion Man is non-stop from beginning to end, requiring split second decisions and reactions and offering great rewards. There's a total of 50 levels included in the game, though 3 of those are boss battles. The standard 47 levels revolve around sploding yourself across the world with a combination of regular splosions, using barrels to get extra splosions, and use of the all so popular Donut Guy(who comes with the best song in the game). The basic sploding is really just a replacement for the jump button, but it also funtions as a splosion. You can splode 3 times in the air before you run out and need to either slide down a wall or walk on the ground for a few seconds before you can go at it again. In the later levels, this wait becomes incredibly crucial as a section may require 4 quick splosions(it's just so much more fun to say than 'jumps') and you have a very small amount of time to make it before some hazard catches up. It's a very simple mechanic that works well and leaves the hard part of the game up to the level design instead of worrying about pressing the correct button. That level design is solid throughout the entire game, with no part of the game feeling cheap. Not once did I get frustrated (and that's basically a miracle for me) because I knew that each obstacle they threw at me could be beaten by playing the game better than I was. The other 3 levels are boss battles that are as fun as they are challenging and each brings a different mechanic to winning with it. It also helps that each boss is interesting and a creative use of the space. But that's only a small place that the Splosion Man's personality comes through. The whole game has a great sense of style and a great personality. From Splosion Man himself down to the poor scientists that get destroyed repeatedly through the game. Splosion Man has a great emotive face and his running and jumping animations make it impossible not to smile at the game. Add in the fact that he's constantly making hilarious noises and yelling things like "get to the chopper" in his great high pitched voice. Then you get to see the scientists react to his presence as they run in terror trying their best not to be sploded. The only problem with that is there's very few story sequences that take advantage of the characters. There's one at the start of the game, and one at the end, and that's basically it. I would have liked to see more comedy through some cutscenes. It could have brought more to the game than just the rock solid mechanics. I must note that there is a multiplayer component to the game that I barely touched. So that wasn't part of the review, but I don't believe that would have changed my score. Also, there's a sweet Mega Man reference. Props to those that catch it. Also also, make sure to check out splosionman.com where the entire soundtrack is available for free. Including the amazing Donut song.